At top, Wes-Haul volunteers Daniel Rubin 06 and Hanako Moondance 06 carry a refrigerator into freshman Jennifer Bunins room in the Fauver Field Residence during Arrival Day Aug. 29. 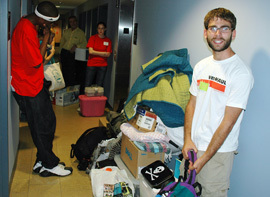 At right, Ian Renner 08 helps carry students belongings into Clark Hall. U-HAUL? Not here. Leave that up to Wes-HAUL, a team of volunteers that welcomed new students to campus. They unloaded cars, carried belongings, directed traffic and answered questions during students Arrival Day Aug. 29. Wes-HAUL started five years ago as a small University Relations initiative and has evolved into a cross-university effort. More than 35 volunteers, including Wesleyan staff members, five spouses and kids of staff members, Diversity Peer Educators, and members of the football team, participated this year. All volunteers received a Wes-HAUL t-shirt, breakfast and lunch. Wes-HAUL volunteer Ian Renner 08 manned Clark Hall, where lived during his freshman year. By 10:30 a.m. he had already moved in two mattress covers and two car loads worth of student belongings. Daniel and Louise Walunis of Cleveland, Ohio appreciated the Wes-HAUL help when moving their daughter, Valerie 09 into her residence. Christine Colfer, administrative assistant for Regional Programs and Networks volunteered for Wes-HAUL, a “once a year opportunity” to meet new students and parents. Her husband, Daniel Colfer, a Public Safety officer, and their daughter Haynie, 12, were also on hand to help. Kiersten Haynie liked what she saw, too. Anyone who would like to volunteer next year can call 860-685-3836 or e-mail mjkingsley@wesleyan.edu. Kevin Butler, assistant dean of Student Services, is the contact person for students with physical differences and co-advisor of the Student Judicial Board. Q: When were you hired at Wesleyan? 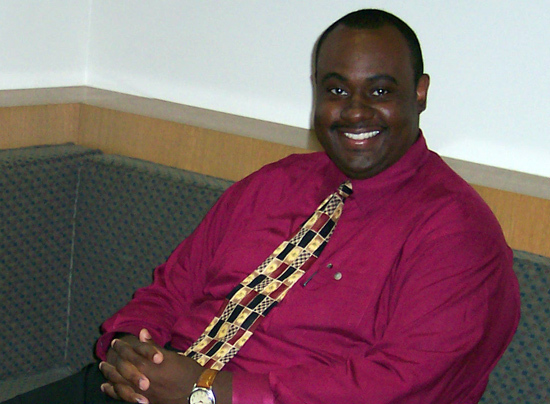 A: I was hired in fall of all 2004 and started in January 2005 as the assistant dean of Student Services. Q: What led you to working at Wesleyan? A: I have excelled in conflict resolution and judicial affairs at several institutions. I thought it would be interesting to advise a student judicial board, which is something I hadnt done before. Q: And what is your role with the Wesleyan Student Judicial Board? A: Im co-advisor with Michael Whaley. It gives me the opportunity to mentor students and help them understand what it means to uphold community standards, and how to successfully communicate that through the decisions the Board makes. Q: Where did you learn about the judicial board process? A: I have worked on judicial boards at Johnson and Wales and been the primary judicial hearing officer for my area as a hall director and area coordinator at Bryant University, Johnson and Wales and Quinnipiac University. In total I have about eight years experience being involved in judicial processes at various institutions. I wanted to be a part of a process that leaned more towards student involvement rather solely administrators making all the decisions. Q: What are your other duties as an assistant dean? A: My position exists to support students in their endeavor to succeed here at Wesleyan. In addition, I have replaced Dean Rick Culliton as the main contact for student with physical differences. Last semester I was able to streamline the process for students who need accommodations under The Americans with Disabilities Act/504 who requested housing and other accommodations. The next step for me will be to start working to offer programming that may help our community become more aware of how people with physical and learning differences are living and functioning every day. Q: Do you interact with students on a daily basis? A: I do have some interaction with students on a daily basis, however not as much as I would like. Because Im new on the staff here, students are just realizing that I can be a resource for them. During orientation for the class of 09 I was able to meet a number of incoming and returning students and start building a rapport with them. Q: What are some of their concerns or questions, and how do you go about resolving problems? A: I have had the opportunity to talk with some students regarding judicial procedures, sanctions and disability and difference accommodations but I think that being here at the beginning of the term will make it easier for me to make connections with students. I am very honest with students. When they come to me seeking advice I try to be constructive and developmental. If I dont know the answer to a questions I try to steer them in the right direction towards someone who is better suited to provide them with the information they are seeking. I always try to get the student to look at both sides of any situation and empower the student to speak up for themselves if that is necessary and/or take responsibility for their part in the situation. Q: What other offices do you meet or collaborate with? A: I collaborate with Graduate Student Services, Residence Life, the Class Deans, Health Services, Behavioral Health and Student Activities and Academic Affairs. 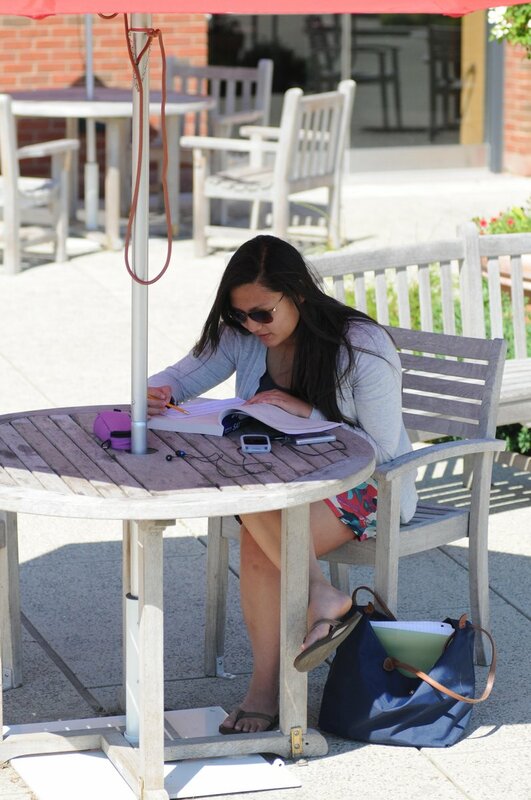 Q: Do you feel most students are aware of all the services Wesleyan offers? A: Probably not. I only say that because there so many. Q: What goes on during your day here? A: It varies from day to day. It is the way Student Affairs professionals survive. It is extremely difficult to anticipate what any day will bring. I am very happy to be working at an institution where my student affairs colleagues understand how important it is to be flexible and have a wealth of knowledge regarding student life issues that ensures our preparedness in case of emergency and celebration. Q: Why do you enjoy working with students and their issues? A: I enjoy working with all students but especially those students that are working through situations for the first time. I enjoy having conversations with students regarding their reasons for being at Wesleyan and how getting an education may be one of the most important things they will ever do. Q: What qualities does it take to be the assistant dean of Student Services? 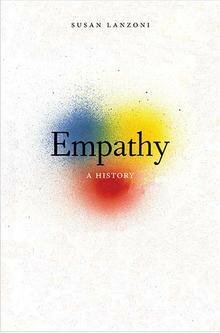 A: When I am asked this question I am reminded of a book I once read in Philosophy 400 class Insight into Insight. 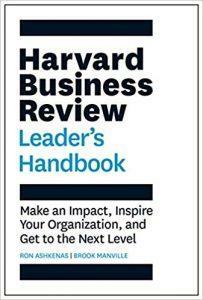 One of the books topics was the ah-ha factor; the realization of an idea. When you are able to witness that process it can be absolutely inspirational. It takes patience and understanding to work in Student Services. There always seems to be someone who needs something. And theres the rub. Helping students is what keeps me enthused about what I do. Q: Where did you attend college and what are your degrees in? A: I got my bachelors of arts in theater from Saint Michaels College in Vermont, and my masters of fine art in performance from the University of North Carolina at Chapel Hill. Q: Are you still interested in the arts? What else? A: I am very interested in film and theater. I used to play a lot of racquetball until I came to Wesleyan. Now I play a lot of squash. I sing in my church choir and play volleyball once a week. 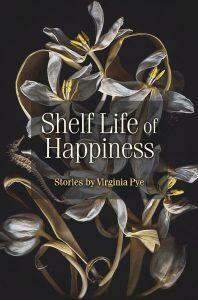 I do a little writing when I can which has been happily complicated by the birth of my son. Q: And what is his name? And your wifes? A: Marshall. Hes seven months old. My wife Carleen works at Quinnipiac University. She coordinates community service and experiential learning. Q: What sums up your personality? A: I am always willing to help. At top, Ricardo Morris, director of the Green Street Arts Center, is developing classes for the centers fall semester. 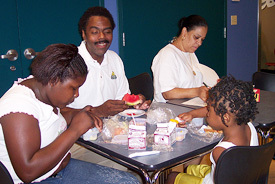 At right, Morris enjoys a snack with participants of the Free Lunch Program inside the center in Middletowns North End. When Ricardo Morris taught English in public schools, he refused to let his students simply read Beowolf. The class would feast, dance and listen to 10th century music  all before opening the epic narrative. His unconventional teaching methods, however, werent appreciated beyond the classroom. Nowadays, his avant-garde lessons are encouraged and respected. As director of the Green Street Arts Center, Morris constantly invents ways to bring creativity into the classroom. Via Green Streets After School Program, Morris immerses youngsters in the visual, media, dramatic and literary arts and music. 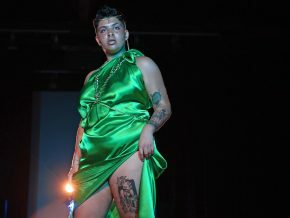 During the evening, he ensures adults and families express themselves through acting to the latest hip hop moves. Morris  a musician, dancer, director, teacher and arts administrator  was brought on to direct the art center just 12 months before its grand opening in January 2005. The centers location in the heart of the Middletowns North End was a familiar environment for the Chattanooga, Tennessee native. Morris was responsible for the overall look and feel of the center, sponsored by Wesleyan, the City of Middletown and the North End Action Team. He used his knowledge of feng shui along with Centerbrook architects, feng shui consultant Pat McGrath, and Jerry Zinser to develop the centers practical layout and powerful color scheme. The Arts Café, for example, is painted in cornflower blue to calm children prior to their art lessons. The visual arts studios are neutral-colored and lit with natural sunlight. Morris, the oldest of five children, is the first and only member of his family to go to college. After earning his bachelors degree in speech and theater from Tennessee State University in 1985, he returned to Chattanooga and taught school for eight years. During his summers off, Morris attended summer institutes studying theater and writing. And in 1994, he applied at Yale, graduating three years later with a masters of fine arts in art administration. 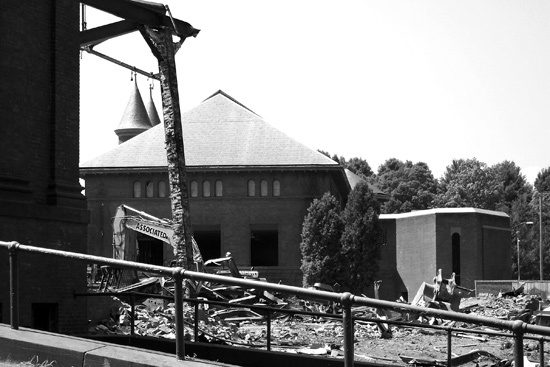 While in New Haven as a graduate student, Morris founded the Dwight/Edgewood Project, collaboration between Yale School of Drama students and children in the Dwight/Edgewood neighborhood. 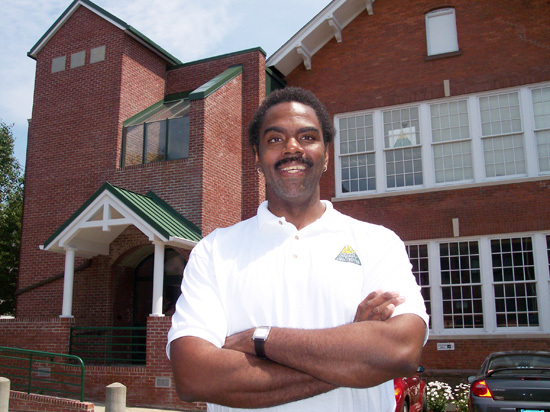 Before accepting his new position at Wesleyan, Morris was the executive director of the Alabama Jazz Hall of Fame and the Carver Theatre for the Performing Arts in Birmingham, Alabama. He also served as director of arts in education for Allied Arts of Chattanooga where he was responsible for the inclusion and promotion of the arts in schools in southeastern Tennessee. Pamela Tatge, director of the Center for the Arts, says it took the Green Street Arts Center search committee eight months to find a Green Street director. At Green Street, Morris hired an assistant director, Manny Rivera; an administrative assistant, Rachel Roccaberton, several community volunteers, 40 teaching artists and over 50 Wesleyan-students, which work as teaching assistants and tutors. 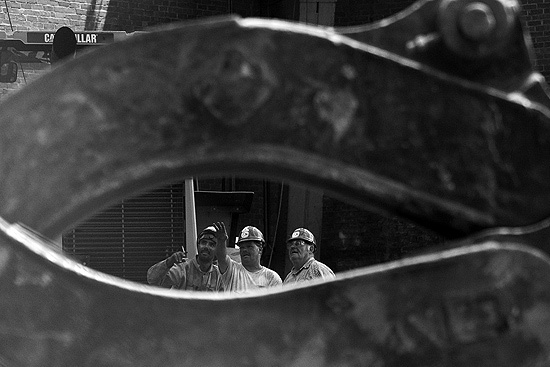 Morris often works a 12-hour day. The center opens at 9 a.m. and the community is welcome anytime. This summer at 11:30 a.m., Morris hosts a free lunch program for community children that also introduces them to a variety of arts disciplines . During the regular school year between 3 and 6 p.m., he helps oversee the centers after-school program, which hosts 7-18-year-olds for visual and applied art, dance, theater, music and film classes. And between 1 and 10 p.m., Morris supervises the adult and family classes and workshops, taught by visiting and Wesleyan artists. Classes range from line dancing, sound design and digital photography to playwriting, bomba drumming and Vejigante mask making, and much more. In fact, he has personally helped out by assisting instructors in ballet, modern dance and recorder classes. During the facilitys first semester, the GSAC had 52 after-school students and 120 adults. Morris goal for the upcoming year is to continue spreading the word about Green Street and enroll 90 students in the after-school program and 250 in the adult evening classes. Monday through Saturday, we want these classes filled to capacity, he says. To stay in tune with the North End and surrounding community, Morris is a member of the North End Action Team, and discusses public safety, housing, police protection and other issues with the community. He has a plot in the community garden, and helps train working artists to become teaching artists. Steven Stemler, a new assistant professor of psychology, will teach Psychological Statistics this fall. 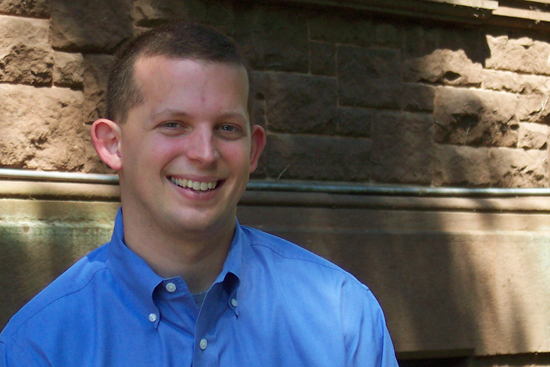 Steve Stemler has joined the Psychology Department as an assistant professor. In an era of increasing specialization, Stemler says he admires Wesleyan for recognizing the importance of training undergraduate students to value the diversity of knowledge accumulated across different fields of study. This fall, Stemler will be teaching Psychological Statistics and anticipates teaching other courses on educational psychology, intelligence, the psychology of good and evil and the psychology of conflict resolution. The Washington State native received his bachelors degree in psychology from the University of Washington and his masters of education and Ph.D from Boston College. He completed his postdoctorial research at Yale University. Before coming to Wesleyan, Stemler was the assistant director of the Yale University Center for the Psychology of Abilities, Competencies, and Expertise (PACE) for more than three years. He also held an appointment with the Framingham State College International Educational Program, a program in which faculty members are sent to various developing countries to teach intensive, two-week courses in their area of specialization. Stemler taught courses in the Dominican Republic and Costa Rica. 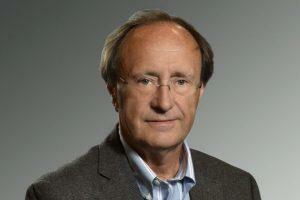 Stemlers research intertwines education and psychology. He studies the purposes of schooling articulated by school mission statements, historical documents, legal court precedent and other sources. His goal is to develop assessments of creativity, wisdom, social and emotional skills that meet the same rigorous standards for testing quality as conventional tests. He presented a paper titled Measuring teachers practical skills, at the annual meeting of the International Association of Cognitive Education and Psychology in Durham, England in July; and another paper titled Practical intelligence and teacher preparation at the annual meeting of the American Educational Research Association in Montreal, Quebec in April. Stemler lives in Hamden, Conn. with his wife Karen and their two yellow labs, Alex and Jack. He enjoys reading, hiking, swimming, walking the dogs, and spending time with his wife. 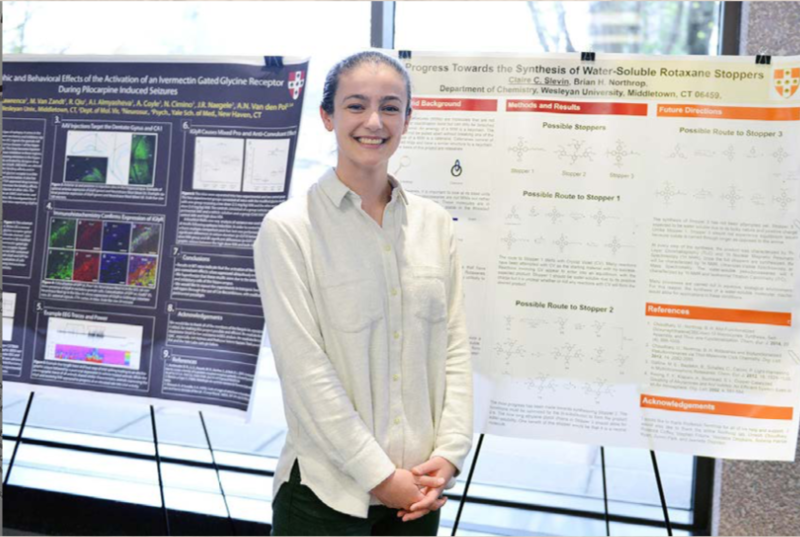 Chimpanzee studies, eating behaviors, mice brains and even sperm banks were topics of research presented at the 17th annual Hughes Summer Research Program Poster Session Aug. 5 at the Exley Science Center. 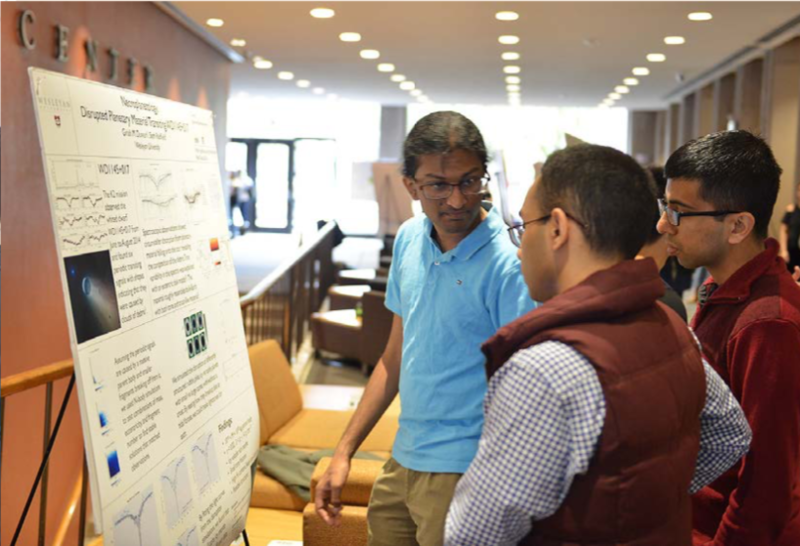 After 10 weeks of intense research, 49 Hughes Fellows presented their projects. 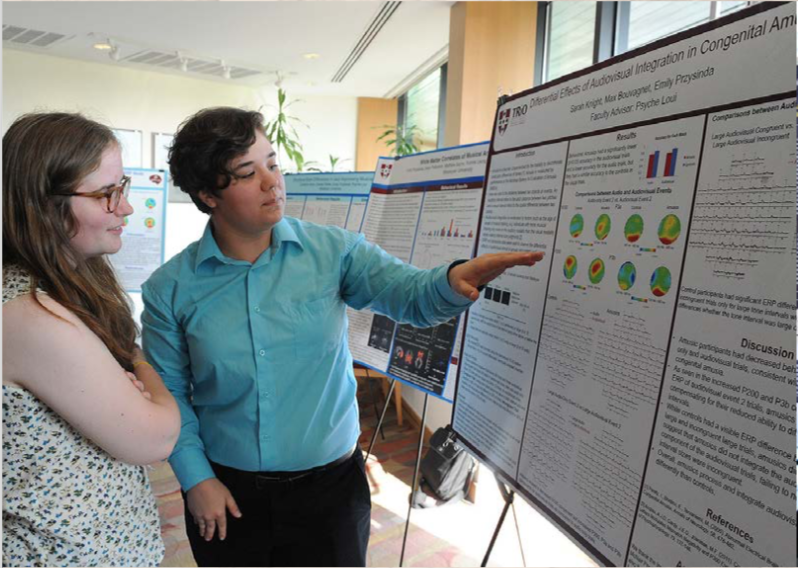 Hughes Fellows are supported by the Hughes Program in the Life Sciences, funded by the Howard Hughes Medical Institute. The fellows worked one-on-one with Wesleyan faculty advisors. For the students presenting, the program gave them a variety of research opportunities that wouldve been difficult to replicate during the school year. For Hughes Fellow Jenna Gopilan ’07, who presented The Effects of Serotonin on Adult Neurogenesis in the Dentale Gyrus of DNA Pkcs Mice, the experience was all about lab conditions, which was a good thing. Michael Weir, professor of biology and chair of the Biology Department is the director of the Hughes Program in the Life Sciences. Laurel Appel, visiting associate professor of biology and senior research associate is the program coordinator. Students applying for the 2006 Hughes Program must do so by March 3, 2006. 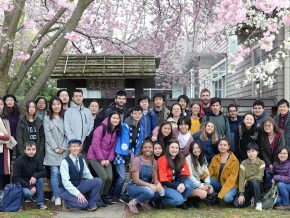 The grant budget allows for 18 stipends, but with generous contributions from participating departments and faculty, as well as Financial Aid funds, the program can accept between 40 and 50 students each year. 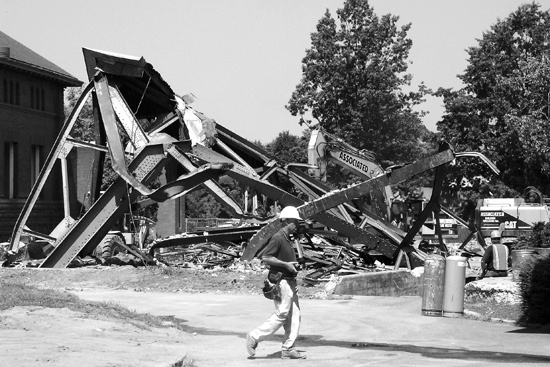 Students are responsible for their own housing. For more information contact Maureen Snow, administrative assistant for the Hughes Program in the Life Sciences, at msnow@wesleyan.edu. Heather Minetti, adult fitness program coordinator, climbs Last Dollar Pass at 11,000 feet during a trip from Telluride, Colorado to Moab, Utah this summer. Q: How do you apply your love for exercising and fitness enthusiasm into your position as the Wesleyan Adult Fitness Program coordinator? 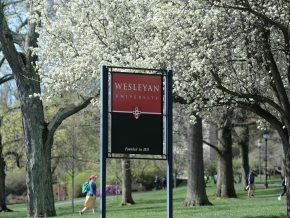 A: I feel very fortunate to be a part of the Wesleyan community. Here, we are surrounded by a very diverse and interesting staff and an administration that actively supports and views opportunities for personal wellness as a benefit that should be available to all. Within walking distance from all corners of campus are outstanding facilities, including indoor and outdoor tracks and tennis courts, one of the finest natatoriums in New England, a new 10,000 square foot fitness center as well as new squash courts. These just scratch the surface. It is easy to get excited about coming to work in this kind of an environment. Q: Do you consider yourself to be a positive role model for the Wes community? A: I try to role model a healthy active lifestyle, a positive attitude and I try to encourage and support safe and effective participation at all levels of intensity, in our fitness programs. Over the years, I have seen many self-professed non-exercisers blossom into athletes and make tremendous lifestyle changes. Helping someone break through a personal fitness barrier is particularly satisfying. Q: Do you coordinate classes and teach? A: My role is to develop, market and assure the provision of a range of wellness programming for all staff. Points of emphasis include the hiring of quality, experienced, instructors, ensuring diversity in the type and intensity of classes and, most importantly, the safety of all participants. I look forward to the close interaction, camaraderie and feedback when actively participating and routinely teach at least one class each semester. This summer, Wesleyan supported my participation in an excellent two-day conference on osteoporosis that I hope to integrate into my work. Q: What are a few examples of Adult Fitness classes at Wesleyan? A: Our goal is to offer a range of wellness opportunities and to encourage safe participation at each level of intensity. We have offered fun, movement oriented activities like ballroom and swing dance, a variety of stretching/toning classes, tai chi, yoga, pilates, as well as strength training, low-impact aerobics, water aerobics and sport specific classes such as squash instruction. Q: Youre also the Lunch & Learn Program coordinator. Tell me a bit about that program. A: The Lunch and Learn program is an educational series that focuses on current health and wellness as well as quality of life topics and issues. This past year featured nationally recognized physicians in the fields of dermatology and cancer care as well as a debate about the Atkins Diet. Q: Why should the average, sit-at-a-desk and stare-at-a-computer all day Wesleyan employee take advantage of these programs? A: There is no down side to taking advantage of the outstanding facilities we have at Wesleyan and by adding a bit of exercise to your day. Whether you join us for a walk, or try tai-chi or ballroom dance, ice skating or do some strength training, you will feel better, interact with some fascinating people, laugh more and, you just might return to that computer refreshed and energized for the afternoon. Q: I understand you recently returned from a bike trip out west. Where did you go? A: A group of friends got together and completed an epic six-night trip on mountain bikes from Telluride, Colorado to Moab, Utah. This was a self-guided trip following unpaved logging and forest service roads with an occasional technical riding section. The route is linked by a series of one-room huts that we reserved almost a year in advance. Q: How many miles did you trek, and/or how many mountains did you climb? A: The trip was just a little over 200 miles long. As we traveled along, we either passed by or traversed through three distinct mountain ranges: the San Miguel and Sneffels Ranges in Colorado and the San Juans in Utah. All three feature multiple peaks in excess of 12,000 feet. Mount Sneffels, at more than 14,000 feet is the highest peak. All were heavily snow covered. 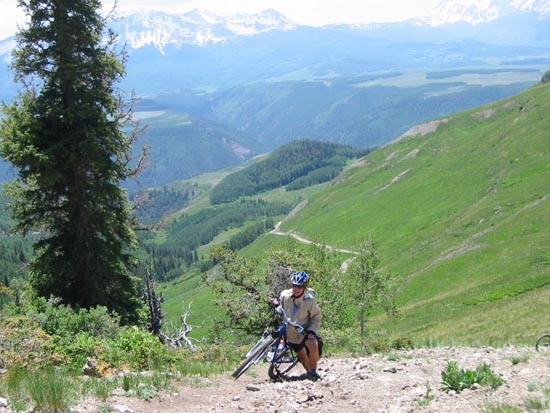 Q: How long have you biked, and what other physical activities do you enjoy, and why? A. I have been biking since I was 10-years-old. My first group adventure ride was a trip from Nova Scotia to Bakerville, Connecticut at age 16. In addition to biking, I have a passion for cross-country skiing, classic style. This year I am committed to taking a couple of lessons in freestyle or skate-skiing. Other outdoor sports that I enjoy are hiking, flat water kayaking and recently I began to do a little running. Q: Where are your degrees from and in what? A: I have a bachelors degree in recreational therapy from the University of Colorado, a bachelors degree in nutritional sciences from the University of Connecticut, and a masters degree in exercise physiology from the University of Connecticut. Q: How long have you worked at Wesleyan? 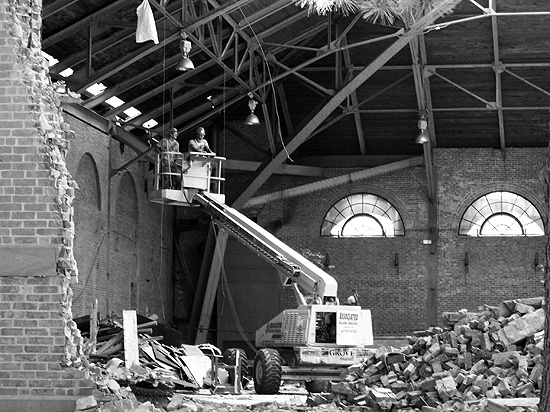 A: I have been working at Wesleyan since January 1991. Q: Do you have other hobbies in addition to fitness-related hobbies? A: Yes, I play in a cribbage tournament each summer and I love to read as well as enjoy quiet time. A: I have both mountain and road bikes. I bought my mountain bike used about 12 years ago for $150 from the Mountain Biking Center at Mount Snow, Vermont. Great deal, great bike, which I have put at least a couple thousand miles on. Last fall, as a birthday gift, my husband purchased a new road bike for me. A Trek 5000. It really is a finely crafted, aggressive riding machine. I am working hard to elevate my riding in order to match the performance of this racing machine, and to keep up with Joan Adams, assistant to the dean of admission. A: My husband, Gary, and I just celebrated our 25th wedding anniversary. We feel fortunate as our interests in adventure travel and fitness have merged over the years. We hike, bike, paddle and ski together. One point of diversion is Garys interest in long-distance backpacking. I prefer a long day-hike. Who can argue with a nice hot shower and a glass of wine at the end of the day? A: Thank God I married an Italian who knows his way around a kitchen. Cooking is just not my strength. Michael Singer, assistant professor of biology, discovered that the wolly bear caterpillar, Grammia geneura, ingests medicinal plants when sick. When tiger moth caterpillars get a bug, they do what a lot of us do – ingest some medicine and hope it provides a cure. These findings by co-investigators Michael Singer, assistant professor of biology, and Elizabeth Bernays, regents professor emerita of entomology at the University of Arizona, appear in the July 27 issue of Nature. During a study of the caterpillars of two types of tiger moths, known as Grammia geneura and Estigmene acrea, Singer and Bernays observed that when the caterpillars were besieged by potentially deadly parasites, they underwent a chemical change that affected their taste sensing cells. 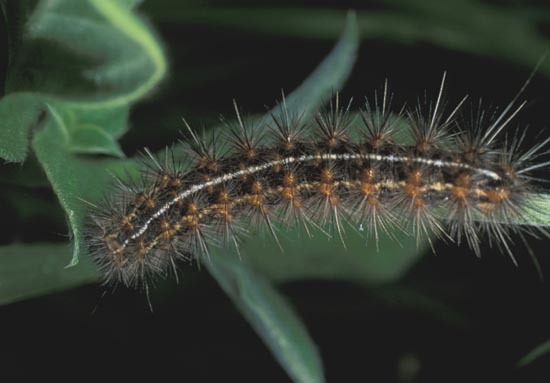 The result: the infected caterpillars suddenly acquired a taste for plants that contained compounds – iridoid glycosides and pyrrolizidine alkaloids. When plants containing these compounds are ingested by the caterpillars the parasites die, often before they could inflict mortal harm on the caterpillars from within. Singer and Bernays noted that the taste for these medicinal components was heightened in the infected caterpillars while remaining unchanged in uninfected caterpillars. Singer adds that this type of chemical “taste change” that gravitates the caterpillars toward medicinal foods has not been observed in other caterpillars, but is likely to occur as in other animals that are known to self-medicate, including some primates. A picture may be a worth a thousands words, but what is its value in the college classroom, especially if the picture is digital? This will be among the issues considered by a new digital image study spearheaded by Wesleyan University and the Center for Educational Technology. The six-month study will examine how digitized images of all sorts are used by faculty at 34 elite teaching and research institutions. The hope is that by assessing current practices in the classrooms, methods for more effective use of these images can be identified and implemented. 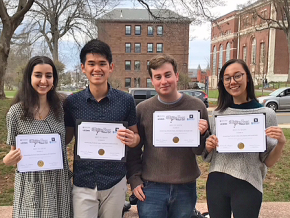 Along with Wesleyan, the institutions participating will include Allegheny, Amherst, Bard, Barnard, Bates, Bennington, Bowdoin, Bryn Mawr, Colby, Colgate, Connecticut, Dickinson, Franklin and Marshall, Gettysburg, Hamilton, Haverford, Holy Cross, Lafayette, Middlebury, Mount Holyoke, Princeton, Sarah Lawrence, Skidmore, Smith, St. Lawrence, Swarthmore, Trinity, Ursinus, Vassar, Wellesley, Wheaton, Williams and Yale. The project has engaged David Green of Knowledge Culture to lead the survey and site visit process. Green’s Web site is http://www.knowledgeculture.com/index.html. The study is being funded by a grant from the Wesleyan Fund for Innovation and is co-sponsored by the Center for Educational Technology with funds from the Andrew W. Mellon Foundation. The results will be presented in a one-day workshop, published and posted on the Academic Commons Web site at http://www.academiccommons.org. Members of the Committee on Planetary and Lunar Exploration (COMPLEX) met at Woodhead Lounge July 20-22. 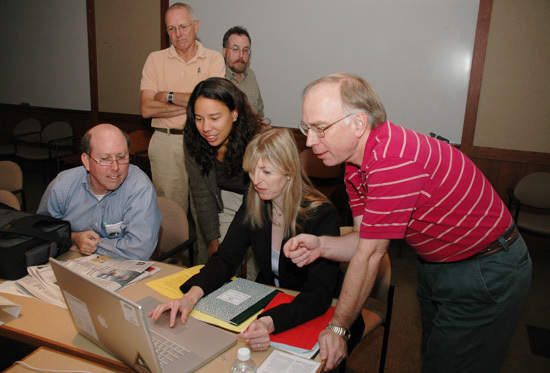 Martha Gilmore, assistant professor of earth and environmental sciences, (pictured second from left in the first row) coordinated the meeting. Martian oceans, solar system exploration and telescopic studies of Neptune were all topics of discussion during a planetary committee meeting at Wesleyan.The Committee on Planetary and Lunar Exploration (COMPLEX) met at Wesleyans Woodhead Lounge July 20-22. COMPLEX advises the National Academies Space Studies Board on the entire range of planetary system studies that can be conducted from space as well as on ground-based activities in support of space-based efforts. The 10-member committee assists the board in carrying out studies, monitoring the implementation of strategies, and providing evaluations of programs and strategic priorities for NASA and other government agencies. 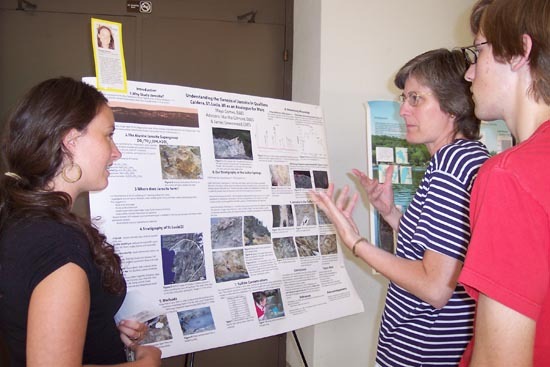 Martha Gilmore, assistant professor of earth and environmental sciences and COMPLEX member, coordinated the Wesleyan meeting. The committee meets about three times a year in various locations. Andrew Dantzler and Douglas McCuistion of NASA Headquarters provided a Mars Exploration Program status report and the status of NASA solar system exploration activities. In addition, Gilmore spoke about the geology and rocks from the opening of the Atlantic Ocean; James Greenwood, research assistant professor and visiting assistant professor of earth and environmental sciences, spoke about geochemistry of a martian ocean; and William Herbst, the John Monroe Van Vleck Professor of Astronomy, chair of the Astronomy Department and director of the Van Vleck Observatory, discussed the circumstellar disk of KH15D. Members of the board included representatives from NASAs Jet Propulsion Laboratory, University of Michigan, University of Texas, University of Arizona, University of Hawaii, University of California, Los Angeles and Johns Hopkins University. For more information on the committee or their projects, visit: http://www7.nationalacademies.org/ssb/complex1.html or http://www.nasa.gov/missions/solarsystem/explore_main.html. 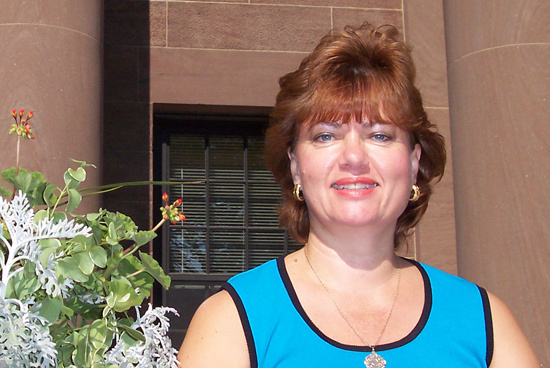 Olga Bookas, procurement specialist, negotiates prices and purchases mailing equipment, furniture, paint, light bulbs, and even window shades for the university. Q: When were you hired in Financial Services as a procurement specialist? A: I started working at Wesleyan in January 2005. Q: Please explain what a procurement specialist means. A: I am responsible for negotiating and developing contracts with vendors. Some of my purchasing duties include processing purchase orders for furniture, lease copiers, cell phones. I also meet with Wesleyan colleagues to determine their purchasing requirements and then I meet with vendors to ensure that they are reliable and can support the university with quality, service and best price. Q: What do you purchase for the university? A: Pretty much anything a university employee needs my assistance with! When I first started here, one of my first objectives was to negotiate the office supplies contract. We are very pleased with the results and the huge savings. Other purchases include the centralization and implementation for new Pitney Bowes mailing equipment, furniture, paint, light bulbs, window shades and much more. In addition, I search for new vendors and find creative opportunities on how to save money for the university. A: For example, Lisa Davis and I worked as a team and convinced four other departments to centralize all outgoing mail and eliminate the leases for additional meters. 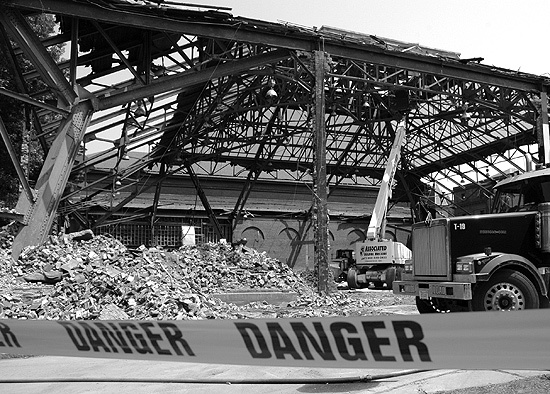 Cost savings for the university resulted $60,000 for a five year contract. Mike Conte and I have finalized the elevator agreement. 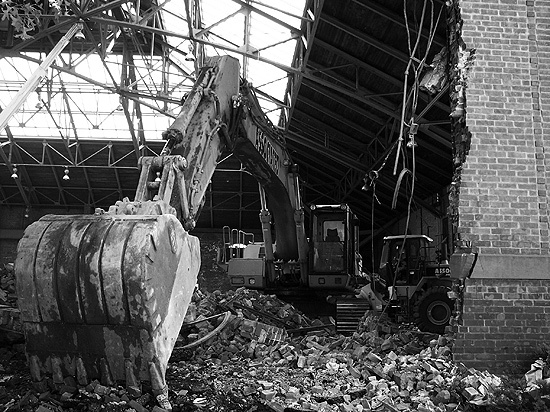 I am currently assisting Peter Staye in negations for the water treatment and oil proposals. Q: You have 18 years experience in customer service and purchasing. Can you elaborate on your past careers? A: Although I worked at Superior Electric for 11 years, I believe my career started when I worked for Heublein. I was the international customer service leader selling Smirnoff and other spirits all over the world! I truly believe in customer service. I feel that we need to service our internal and external customers the best and fastest way we can! I gained vast experience on international laws, shipping, exporting goods, and had fun selling some of our best wines to the Army! Q: How did you come to Wesleyan? A: My career changed due to Heubleins downsizing. After taking a year off, I completed my associates degree and within a month, I was hired at Associated Spring/Barnes Group as a purchasing assistant. My love to negotiate started to flourish when I started to deal with vendors. My path brought me to Wesleyan where I strongly believe that working together as a team we can achieve huge savings for the university and continue to implement purchasing procedures and processes to make it easier for our internal customers and departments. Q: Was it a straightforward or challenging transition from the corporate world? A: I always wanted to work for an educational institution where one can excel and bring new ideas. My experience so far has been rewarding and a little challenging at times. I like challenges because I feel it is a great opportunity to learn and try new things. Q: Can you fill me in on any new initiatives or projects? A: We have successfully launched the office supplies project where 95 percent of our employees go to our Web site and place their orders on line. That is a huge time savings! Q: How do these purchasing skills carry over into your personal life? A: I do watch prices either at grocery stores or when I purchase items for the house. I do the negotiating. Negotiating for me comes natural. A: I obtained an associates degree in business management from Tunxis Community College and a bachelors of science degree from Saint Joseph’s College. A: I love to walk and listen to Greek music. I have a couple of friends that I go walking with almost every morning at 4:45 a.m. and at night. Also, I like to read a lot. My favorites are mystery and murder novels. Q: Are you involved in any volunteering activities? A: I volunteer a lot of my time to my church. I teach the Greek Language to children and adults at my church. The class began with only five children and two adults three years ago and now we have over 30 children and seven adults. Ive also been president of the Philoptochos Society for 15 years. Philoptochos means Friend of the Poor. This womens organization is the right hand of the Greek Orthodox Church. I also have been one of the Friendly Visitors at the local convalescent homes visiting the elderly once a week. Q: Would you like to tell me about your family? A: My husband, Tony, and I have been married for 35 years and live in Bristol. We have two children, George and Angela and a dog named Liza. Our son and his wife, Renee, also live in Bristol. Angela lives in our apartment upstairs. We feel blessed that our family lives so close because all our extended relatives are back in Athens, Greece. Q: Greece. So that would explain your accent. A: Yes. My coworkers tell me that I have a cute Greek accent. My voice is easily recognized. 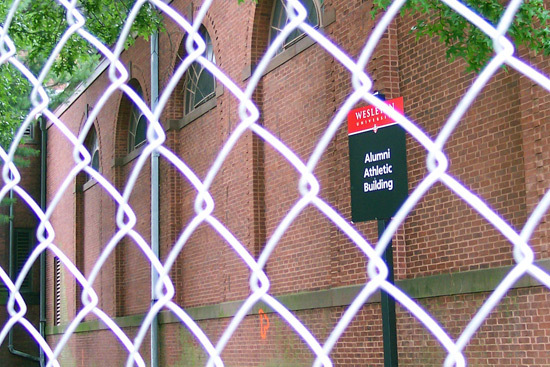 THE CAGE, CAGED: An 8-foot chain link fence surrounds the old Alumni Athletic Building, also known as the ‘Cage,’ to mark the construction zone for the new Suzanne Lemberg Usdan University Center, which is expected to be completed in August 2007. Parts of the gym are being renovated and incorporated into the new facility. 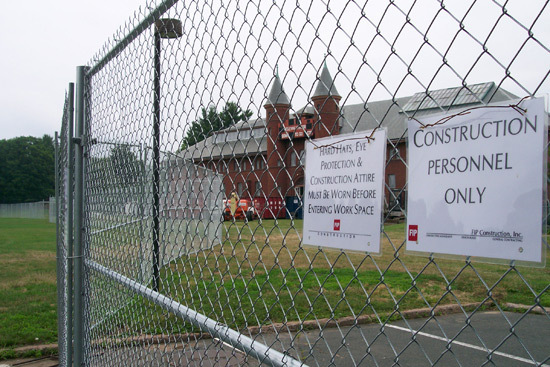 Only construction personnel are allowed into the fenced-off construction zone surrounding the old Alumni Athletic Building and Fayerweather Gymnasium. A new gravel access road will line this fence for foot traffic, handicap, emergency, service and construction vehicles only. 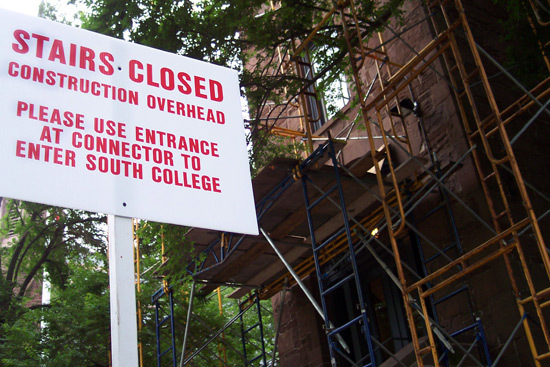 South College is receiving an interior and belfry renovation this month. 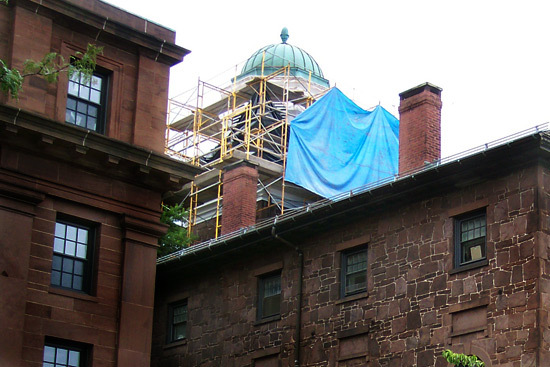 Stairwells are being repainted and the building’s front entrance is closed.